I saw this back at Columbia, Missouri’s True/False film festival in February 2009. Now it’s Oscar-nominated. I wrote up a short review at the time. The Western world concerns itself with issues like that of bias in the media. 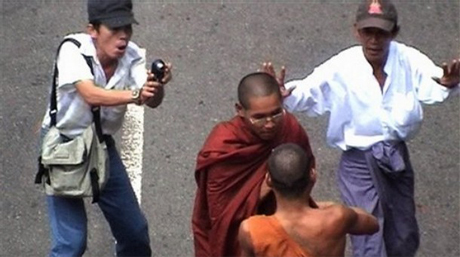 In Burma, journalism is illegal. The impact of “Burma VJ” is pretty straightforward. These VJs, living under a militaristic government, risk their lives to get footage of the crimes against humanity in their country–the killing of Buddhist monks, the extreme crowd control–and smuggle it out so the world can see (as well as back into Burma to counteract the government’s propaganda). It’s hard to get a sense of just what director Anders Ostergaard brings to this story as he creates a film: his greatest achievement is that he simply lets his source, named Joshua, tell his story. The issue speaks for itself and the footage these daring citizens capture is plenty to awaken anyone unaware of the situation in Burma to the tragedy there. Certain parts are more compelling than others, but in general, “Burma VJ” executes to the fullest what every good documentary should: enlighten. The film’s impact goes a bit beyond into the realm of courage and sacrifice of the citizen to stand up to wrongdoing in his or her country–certainly unique in that this comes to light through illegal journalism–but mostly you are left with becoming aware and upset that a government would treat its people this way, glad to live somewhere where journalism is an institution. Suddenly the conflict we see every day between the media and establishment seems so totally insignificant. It’s a reminder of how important the work of the journalist is and how it’s a privilege to have in a country, which ultimately is about the privilege of being free in a country.